Maximum International, Graviola is a natural dietary supplement which contains graviola leaves powder closed in capsules. The product has been produced according to the rules of Good Manufacturing Practice (GMP), which is why its health value is very high. Graviola leaves show proven anticancer and anti-parasitic properties as well as they stabilize and mitigate bad mood. Graviola not only supports the treatment of cancers but can be also used in the prevention of hypertension, fever, rheumatism and fungal infections. Graviola contains many nutritional substances. The plant contains i.a. B-vitamins (B1, B2, B3, B5 and B6), vitamin C and minerals (potassium, calcium, sodium, copper, iron and magnesium). Graviola contains also alkaloids and phenolic compounds which show strong antioxidant properties. However, the most important role in fighting cancer cells is assigned to annonaceous acetogenins. The researchers have proven the present of biologically active components which are called annonaceous acetogenins and show anticancer properties. These substances, even in small doses, affect specific kinds of cancer cells and slow down the enzymatic processes which occur in these cells. Moreover, this plant supports the regeneration of the body system after chemotherapy. Acetogenins are also inhibitors of an oxidative complex I of the phosphoric chain, which is why they can block the synthesis of energy necessary for the cancer cells and reduce the activity of ubiquinol oxidase, an enzyme present in the membrane of a cancer cell. According to the researchers from the American Health Science Institute, the graviola bark extract contains alkaloids which can be effective in fighting up to twelve kinds of cancers, i.a. colon, breast, prostate, lung, liver and pancreas cancers. What is important, this plant damages the cancer cells without causing any damage to healthy cells and does not cause nausea, excessive hair or weight loss, which gives it an advantage over chemotherapy. The compounds of similar properties have been found also in graviola fruits. The substances contained in the plant are not only effective but also safe, as they don’t cause any side effects. Bark, roots and leaves of graviola are used also to reduce high blood pressure, prevent convulsions and to calm down. This plant can be also effective in mitigating the symptoms of depression and chronic fatigue, because it has been observed that the substances present in it have effects similar to serotonin, a neurotransmitter responsible for good mood. Moreover, graviola is also used in case of parasitic infections, ulcers, skin problems, inflammations, hepatic disorders and fever. The plant is also believed to be effective in mitigating the symptoms of asthma, rheumatism, diarrhoea and fever. Graviola is also used for the production of milk in lactating women. To sum it all up, Maximum International Graviola is a product whose multidirectional healing properties make it useful in case of complementing the treatment, mitigating the results of chemotherapy and as an element of cancer prevention. The product can support the treatment of high blood pressure, parasiting infections, weakness, mood deterioration or skin problems. Take 2 capsules, 3–4 times a day. 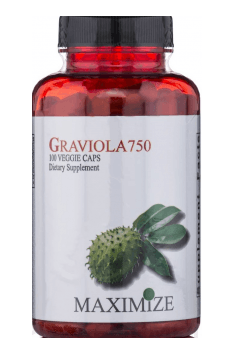 There is no clear daily dose of graviola established yet. Normally, the doses amount for from 600 mg to 5 g a day. Graviola should be applied on an empty stomach with water. People with a sensitive stomach can take the preparation with a meal. Strong antibacterial properties of graviola can imbalance the natural microflora of digestive tract, so in case of a therapy lasting longer that 30 days it is recommended to additionally take preparations containing probiotics. Maximum International is an American manufacturer of dietary supplements with unique health properties, derived from naturally occurring ingredients, such as Graviola. The range of these properties is very wide and each of them has been confirmed in clinical trials, to which the brand pays maximum attention.